TAC members occupied Khayelitsha District Hospital on Wednesday. The protesters were addressed by hospital CEO Dr Anwar Kharwa. Treatment Action Campaign (TAC) members occupied the trauma ward of Khayelitsha Day Hospital on Mandela Day. About 50 people entered the hospital during visiting hours, posing as visitors to patients. They went to the trauma ward, and then revealed their iconic HIV-positive T-shirts. The protest, which went down without incident, nor any significant disruption to the hospital, highlighted service problems at the facility. While the protest was taking place inside, about a hundred TAC members were outside the hospital holding up placards and singing struggle songs. On 14 May 2013 the TAC submitted a list of 30 testimonials from patients unhappy with service in the hospital. Several meetings with the hospital management have been held since then. In April 2018, a list of demands was presented to hospital management concerning long waiting times in the emergency department, a shortage of beds, poor treatment by hospital staff and insufficient doctors. "We cannot celebrate Mandela Day, while there are still people who are sleeping on the floor at Khayelitsha District Hospital. This is not what Mandela fought for", said TAC member Karabo Monatisi. Phumeza Runeyi, the TAC's Deputy Chairperson, said, "Patients seemed happy to learn that there are people out there who are aware of the challenges they face. Staff members were also happy to see us. Some of them even thanked us for taking this action. We acknowledge that staff members are aware of the problems, but they can't really talk because they are scared of losing their jobs." Hospital CEO Dr Anwar Kharwa apologized to the TAC members that they felt the need to take more action. He said that a new ward has been opened in the hospital, following meetings with TAC. Kharwa said there has been some work done to improve the facility. 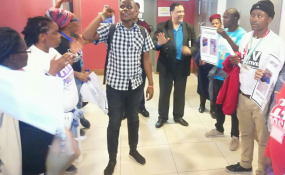 He invited the TAC leadership to a meeting on Tuesday 24 July, where he will show them proof that the hospital has taken some action. Dr Kharwa made a plea saying he wanted that TAC and the hospital to work together to improve the facility so that the people of Khayelitsha can access the best care they need. Runeyi responded that TAC is looking forward to the meeting with Kharwa and to see the new developments. "We are willing to work with him to better Khayelitsha District Hospital."